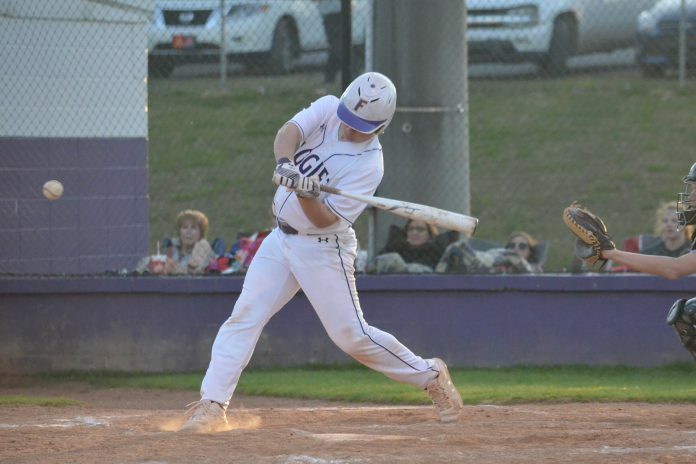 FAIRVIEW, Ala. – Douglas jumped out to an early 4-0 lead in the first two innings, but the Aggies rallied offensively and came from behind to defeat the Eagles 18-8. Preston Ryan started on the mound for Fairview and allowed just two earned runs in the win while picking up six strikeouts. A sacrifice fly from Malcolm Parker cut the lead to 4-1 in the bottom of the second and Dalton Payne made it a 4-3 game with a 2-run homer in the third. Back to back RBI doubles from Jack Brown and Parker gave the Aggies a 6-4 lead going into the fourth, but Douglas plated two runs on an error in the top of the fifth to tie the game at 6. A pair of bases-loaded walks and an error allowed Fairview to move back in front 9-6 in the bottom half of the fifth and the Aggies blew things open in the sixth. A homerun cut the lead to 9-8 in the top of the sixth but RBI doubles from Payne and Parker along with RBI singles from Parker Martin and Oakley Mullican helped Fairview plate nine runs in the frame and end the game after six innings with a 10-run lead. Parker collected two hits and led the Aggies with five RBIs in the win. Payne finished with three hits and three RBIs of his own Mullican drove in a pair of runs as well. Priceville got the first runs of the game in their opening at-bats on a passed ball, an error, and a wild pitch. Another Eagle error led to the fourth run of the game for the Bulldogs in the second inning. Vinemont got that run back in their half when Austin Riddle singled and later came around to score on a Priceville error and Clay Rogers added a two-out RBI single to make it a 4-2 game. Priceville made it 5-2 in the third on another Eagle error; they increased it to 7-2 in the fourth on an RBI single and on a wild pitch. Vinemont cut it to 7-3 in their half as Travis Hopper scored on an error. The Bulldogs, though, added two more in the fifth on a passed ball and an RBI groundout to make it 9-3. Hudson Wood scored on a passed ball for Vinemont to cut it to 9-4. Priceville increased it to 10-4 on a wild pitch, but Vinemont answered right back in their half on a Rogers RBI single to make it a 10-5 contest. The Eagles looked to add some more runs in their final at-bats as they loaded the bases with no outs, but a double play and a fielder's choice got Priceville out of the inning and Vinemont wound up falling at home 10-5. Rogers finished with a pair of hits and two RBIs for Vinemont, who are now 8-7 overall on the season. Riddle added three hits and he scored a run. Hopper ended up with two hits and a run scored. Teague Whatley finished with a hit and a run scored. Zander Noblett and Wyatt Thomason each chipped in with a hit. The Eagles won't play again until April 1st when they host Locust Fork. After falling behind 3-0 in the bottom of the second, Cullman answered with three runs of their own in the top of the third to tie things up. The Senators retook the lead in the fourth inning and the ‘Cats weren’t able to respond offensively, allowing Sparkman to hold on and win it 6-4. Brady Patterson (one hit) finished with a team-high two RBIs and Brennen Norton (one hit) drove in a run as well. Brennen Norton was 3-for-4 at the plate with three RBIs in the win and Dylon Wallace (two hits) and Peyton Colvard each drove in a pair of runs for the Bearcats. The Warriors tacked on a run in the first and second innings to take an early 2-0 lead and after the Aggies made it 2-1 in the top of the third, West Point scored three in the bottom half of the third to put the game out of reach. Aubry Cleghorn (one hit) and Branson Smith (one hit) each collected an RBI for West Point in the win and Cooper Couch led the Warriors with two hits. Levi Scott tossed all seven innings and allowed just two earned runs in the win while collecting five strikeouts. Dora put the Raiders in a hole early after they plated three runs in the top of the first and one more in the second to take a quick 4-0 lead. Good Hope tacked on a run in the bottom of the third but couldn’t get anything else going offensively and fell at home 7-1. Matt Hancock (one RBI), Colton Williams, Preston Bagwell and Harper Chiaranda recorded the only hits of the game for the Raiders.